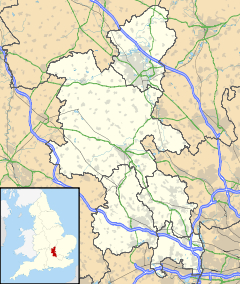 California is an area of Aylesbury town centre in Buckinghamshire, England. It was originally a hamlet to the south side of the town. The hamlet is probably named after the U.S. state of California, though its history goes back long before the state was known to British people. The name of the original farm was therefore most likely changed to California at some point before 1839. It is widely believed that the hamlet was named after visiting American servicemen during the Second World War; however, 19th-century maps prove this to be incorrect. Until the arrival of the Wycombe Railway in Aylesbury in 1863, California was the name of a farm and related buildings that stood in the area. However, with the arrival of the railway, cottages were constructed in the location of the farm to house railway workers and the area became known as the Hamlet of California. In 1867, printing and publishing firm, Hazell, Watson and Viney, opened an Print Factory in a disused silk mill in the hamlet. In 1878, this was moved to purpose built premises on the Tring Road, the building was then used for their inkworks which closed in 1952. By the early 1920s Aylesbury had grown such that it was necessary to start building houses on the site of Southcourt (the other side of California from Aylesbury), and so California and the associated farmlands that surrounded it became part of Aylesbury town. Eventually the farmlands themselves were built on, though the railway cottages that formed the hamlet remained until the early 1960's. In 1924, the Bishop of Oxford transferred lands owned in California, into the hands of the Municipal Borough of Aylesbury, which in 1929 was partially used in the construction of a new church which is currently located on Penn Road. The site was home to the "California Industrial Estate" until 2005 when it was demolished to make way for a new housing estate, renamed the "Grand Central" due to its proximity to the centre of Aylesbury. As of November 2006 the building work has nearly finished and it is likely that the hamlet will be forgotten as it has been completely swamped by Aylesbury's development. ^ "Buckinghamshire XXVIII.SE (includes: Aylesbury; Bierton with Broughton; Hartwell; Quarrendon; Weedon.) Revised: 1898". National Library of Scotland. Buckinghamshire: Ordnance Survey. 1898. Retrieved 29 May 2015. ^ "Records of Hazell, Watson and Viney Ltd, printers, Aylesbury, 1709-c.1991". The National Archives. 1995. Retrieved 28 May 2015. ^ "Aylesbury, St Mary's to 1989". The National Archives. Oxfordshire History Centre. 1989. Retrieved 28 May 2015. ^ "Railway Club, Ayylesbury (California)". www.aylesbury.co.uk. Retrieved 12 February 2016. ^ "Southcourt Community Centre - AVDC". www.aylesburyvaledc.gov.uk. Retrieved 12 February 2016. This page was last edited on 12 March 2019, at 08:53 (UTC).